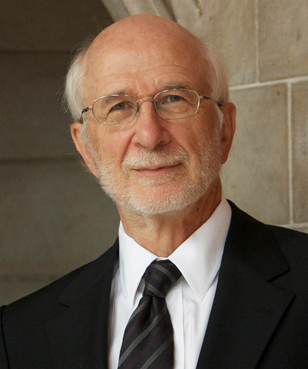 Professor Emeritus Russell Hartenberger is former chair of percussion at music@UofT and former Dean of the Faculty of Music. He has been a member of both the percussion group, Nexus, and Steve Reich and Musicians since 1971. He holds a Ph.D. in World Music from Wesleyan University, specializing in the music of West Africa, North and South India, and Indonesia. As a member of Nexus, he has performed with leading orchestras in North America, Europe and Asia, and along with members of Nexus created the sound track for the Academy Award winning Full Length Documentary, The Man Who Skied Down Everest. With Steve Reich and Musicians he recorded for ECM, DGG and Nonesuch Records, and performed on the Grammy Award winning recording of Music for 18 Musicians. He has performed and/or recorded with such diverse musicians as Gil Evans, John Cage, Steve Gadd, Peter Erskine, Michael Nyman, Pablo Casals, Canadian Brass, Kronos String Quartet, Peter Schickele, Richard Stoltzman, Toru Takemitsu, Jack DeJohnette, and Yo-Yo Ma. His compositions include The Invisible Proverb, Telisi Odyssey, and Cadence, published by Keyboard Percussion Publications, and Raghavan, published by HoneyRock. His arrangements for percussion include Persian Songs with Iranian vocalist, Sepideh Raissadat, and Moondog Suite. His article “Encounters with John Cage” appeared in the Sept. 2012 issue of Percussive Notes and his essay, “Clapping Music: A Performer’s Perspective,” is in The Ashgate Research Companion to Minimalist and Postminimalist Music (Ashgate 2013).